A replica of Air Force One is transported up the Potomac River to Washington D.C.
A replica of Air Force One traveled down the Potomac River on Monday morning on its way to a new exhibit at the National Harbor. The “Air Force One Experience” exhibit will include tours of the plane and presidential artifacts stretching back to the days of Presidents George Washington and Abraham Lincoln. Air Force One is the air traffic control call sign for the air craft carrying the U.S. President. Billed as a “one-of-a-kind” tour, the “Air Force One Experience” opens Oct. 19 and is located just south of Washington D.C. in Oxon Hill, Md. The tour lasts approximately one hour and is part of The Children’s Democracy Project, an initiative to get children to experience democracy in action. 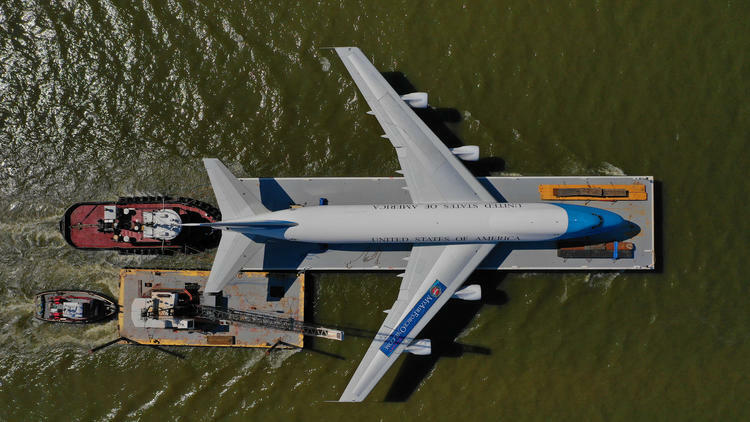 According to the Washington Business Journal, the “Air Force One Experience” features a full-size Boeing 747 replica of the U.S. presidential plane and is being transported via barge to the National Harbor from Rhode Island, where the plane was refurbished. It is scheduled to stay at the National Harbor through the holiday season.